Are you looking for a fun and adventurous day outside? Check out these amusement parks in Virginia! You will be entertained for hours between the roller-coasters, games, and food. We have a complete guide to the best Virginia amusement parks right here! One of the most beautiful and the most stunning Virginia amusement theme parks is definitely Busch Gardens. With its breathtaking landscape and European theme hamlets (Great Britain, France, Germany and Italy), Christmas Town, Howl-O-Scream attractions and wild life reserve, it will leave nobody indifferent. For the bold ones there are the craziest roller coasters in the world to challenge your limits. And there is really great food, to top it all. Simply put, Busch Gardens offers the best entertainment guaranteed for the whole family from March-December! The best choice to enjoy the sun and water thrills is without a doubt Water Country USA. It is a water amusement park in Virginia and the Mid-Atlantic's largest water park. Offering the myriad of attractions, live entertainment, water rides, shops and restaurants, it celebrates the 1950s or 1960s careless joy of life and surf. Bring your family or your friends once, and you will all become regular visitors! Choose your own rides or slides, maybe a Wave Pool or a Lazy River, and the party is about to begin. Get set for a May-September surfing season! If you ever wondered what the earth once looked like in its prehistoric past, this is a wonderful opportunity to enter the world of the Mesozoic era, when the only living creatures on this planet were dinosaurs. 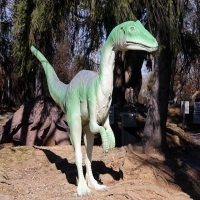 Dinosaur Land has been Virginia's amusement park for 50 years, and it is still attractive to people of all ages as it once was half a century ago, when it first opened. Come and spend some time with dinosaurs, and afterwards enjoy a visit to an enormous gift shop with silver jewelry, t-shirts, books, leather goods, souvenirs, and of course dinosaurs awaiting you.